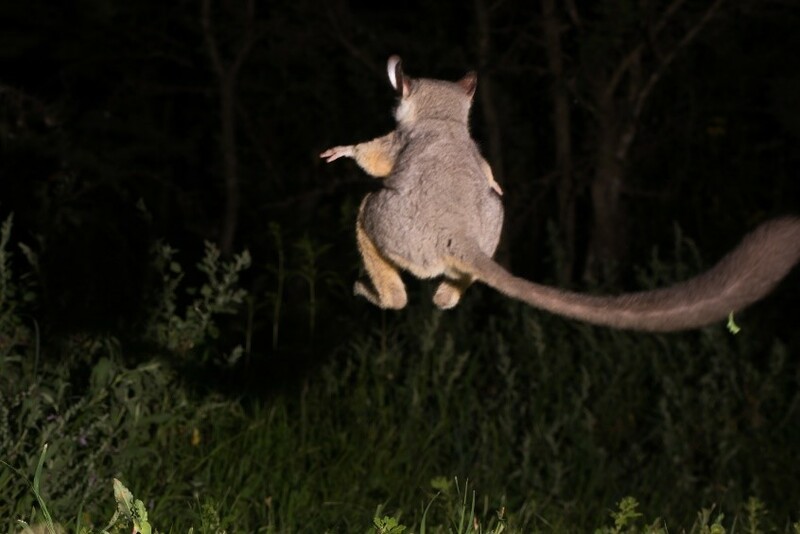 Methods used to shine light on the distribution and abundance of the Kenya Lesser Galago on Lolldaiga Hills Ranch, Kenya - Lolldaiga Hills Ltd.
Galagos, or ‘bushbabies’, are nocturnal primates distributed across much of sub-Saharan Africa (Butynski et al. 2013). They are the oldest extant primates, occupying the basal position in Primate phylogeny (Perelman et al. 2011). Reviews of the taxonomy and diversity of galagos highlight the lack of data available on currently acknowledged and potentially new species (Grubb et al. 2003; De Jong & Butynski 2012; Butynski et al. 2013). 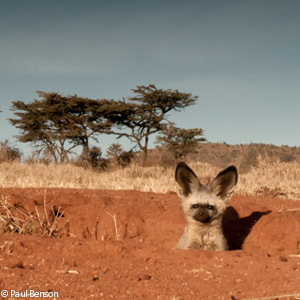 Research on the behaviour and ecology of free-ranging populations of galagos is urgently needed in the face of increasing anthropogenic pressure (Bearder et al. 2003). The Northern Lesser Galago Galago senegalensis is the most widely distributed of the galagos, yet the literature on its behaviour and ecology is limited (Nash et al. 2013). Figure 1. Kenya Lesser Galago Galago senegalensis braccatus, central Kenya. Photograph by Yvonne de Jong & Tom Butynski. The main aim of our study is to assess the distribution and abundance of the Kenya Lesser Galago G. s. braccatus (Figures 1 & 2) on Lolldaiga Hills Ranch. We collected habitat data and used distance sampling, camera traps, and passive acoustic recorders to detect their presence. We spent just under 5 weeks (28 June 2018–30 July 2018) on Lolldaiga Hills Ranch, using Dik-Dik Research Camp as our base. Here we describe the methods used during this study and provide preliminary results on the effectiveness of these methods. Figure 2. Kenya Lesser Galago Galago senegalensis braccatus, Mukima Ridge, central Kenya. Photograph by Paul Benson. We used a map of the tracks in Lolldaiga Hills Ranch to predetermine transects for distance sampling (Figure 3). Each night, between 19:00 h and 23:00 h, we slowly (<10 km/h) drove one randomly chosen transect. We drove 100 km of transects in total (N=15). 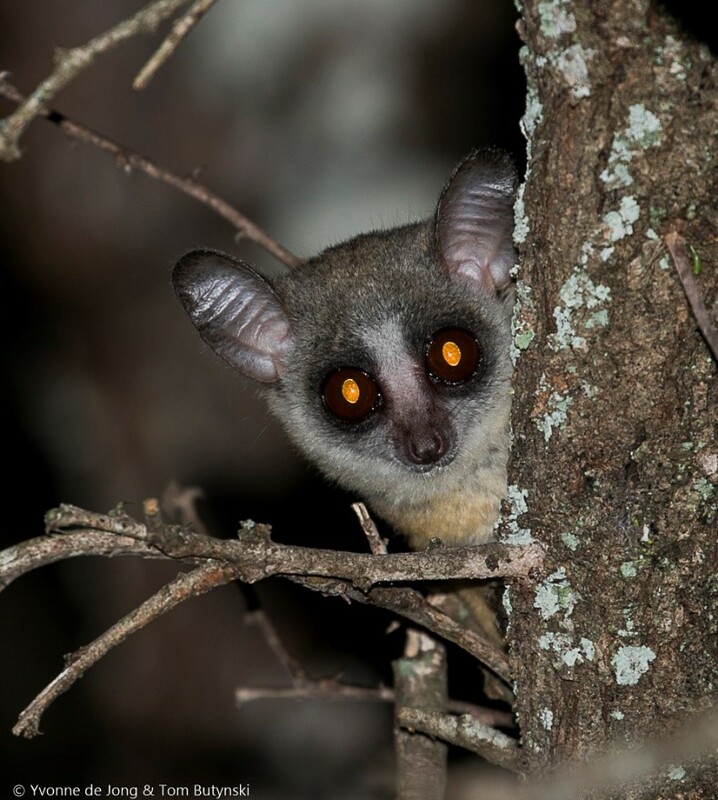 With the help of torches, at least three researchers searched for galagos from both sides of the vehicle. 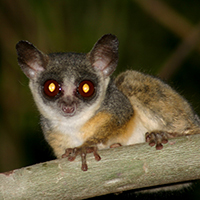 We found galagos by their yellow/orange eye shine and leaping locomotion. We encountered galagos 178 times (total of 220 individuals). When we spotted a galago, we marked the location and altitude using a GPS and noted: number of individuals; estimated distance perpendicular to the vehicle; height above ground of each galago when first sighted (ground; <0–4 m; 4–8 m; 8–12 m; >12 m); and habitat (e.g., grassland; woodland; bushland; riverine). During the day we repeated each transect to map habitat and note the most common tree species. Figure 3. 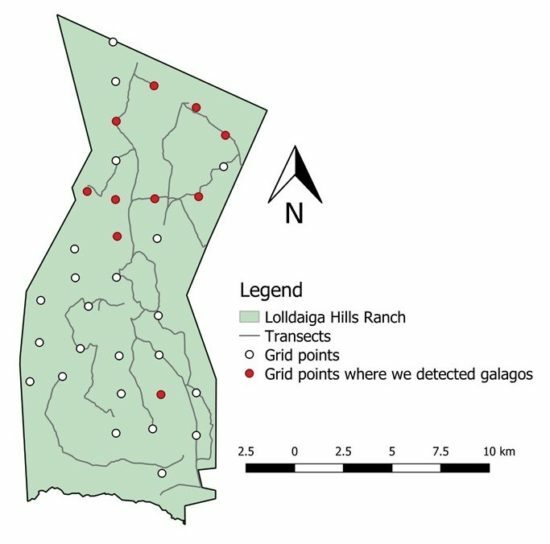 Lolldaiga Hills Ranch, central Kenya, with the transects and grid points used to collect data during this study of Kenya Lesser Galago Galago senegalensis braccatus. The red dots are where galagos were detected by camera trap and/or passive acoustic recorder. We generated a 2 x 2 km grid across Lolldaiga Hills Ranch and referred to the corners as ‘points’. We divided the entire area into four sections (NE/NW/SE/SW) and visited 8–10 points in one of the sections each week. At the nearest and safest place to the point we placed: 1) a Bushnell (https://www.bushnell.com/) camera trap baited with chunks of pineapple and banana; 2) a Reed temperature and humidity data logger (http://www.reedinstruments.com; 3) a passive acoustic recorder (Audiomoth; Hill et al. 2018; [https://www.openacousticdevices.info]) at seven points; and 4) a Song Meter (https://www.wildlifeacoustics.com) at one point (Figure 4). Figure 4. Simon placing a camera trap, our supervisor (Dr. Caroline Bettridge) attaching a temperature and humidity data logger and Audiomoth, and Amelia waiting to place fruit in view of the camera trap. Photograph by Grace Ellison. We had several equipment failures, including two broken camera traps, scheduling failures on the Song Meter and on one of the Audiomoths, and water damage to one of the Audiomoths. Fortunately, all but one point always had either a working passive acoustic recorder or camera trap. We aimed to sample each point for 5–6 nights each but, due to the equipment failures, the number of trap nights varied. We sampled 33 points for 1–6 nights each, totaling 142 trap nights. 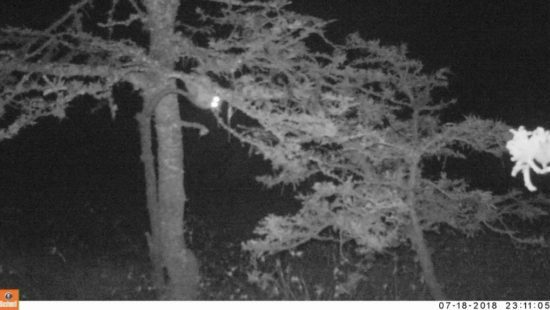 The bait was effective in attracting galagos to the camera traps (Figure 5). Figure 5. Kenya Lesser Galago Galago senegalensis braccatus with a piece of fruit on Lolldaiga Hills Ranch. Camera trap photograph by the authors. 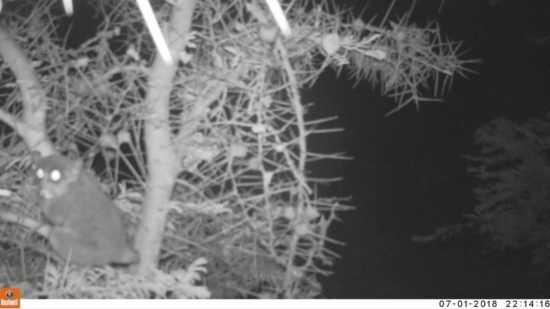 Preliminary results show that galagos are more abundant in woodland areas dominated by Whistling Thorn Acacia Acacia drepanolobium than in other habitat types on Lolldaiga Hills Ranch. We will use these data to determine habitat and temperature preferences of G. s. braccatus on Lolldaiga Hills Ranch, estimate their population density, and predict where other populations may be in Laikipia and potentially other areas across the species’ range. Figure 6. Kenya Lesser Galago Galago senegalensis braccatus investigating an un-chewed sugar-baited string on Lolldaiga Hills Ranch. Camera trap photograph by the authors. As part of Grace’s PhD research, we used a non-invasive method for collecting saliva for genetic analysis. This method, successful in northern Tanzania, involves hanging sterile nylon strings baited with either sugar syrup or honey (Smiley Evans et al. 2015). We hung baited strings at sites where we saw galagos during transects. These sites were usually areas dominated by Whistling Thorn Acacia. We monitored the strings, either by camera trap or by examination, the next day to see if the strings had been chewed. 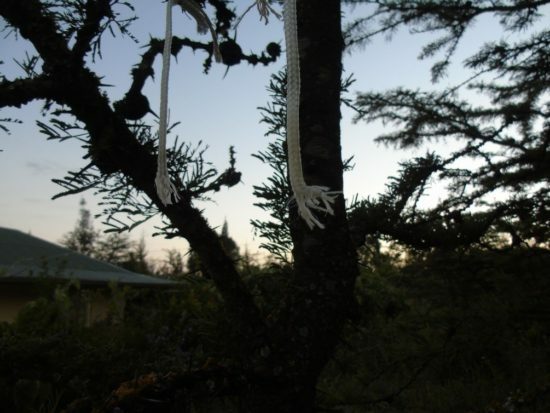 No galagos chewed the strings placed on Lolldaiga Hills Ranch (Figure 6) but we obtained 15 chewed strings from Mukima Ridge, south of the Ranch (Figure 7). We plan to export the samples to the UK for genetic analysis. Figure 7. Sugar-baited nylon strings that were chewed by a Kenya Lesser Galago Galago senegalensis braccatus on Mukima Ridge, central Kenya. Photograph by Grace Ellison. We are grateful for the opportunity to conduct research on Lolldaiga Hills Ranch. 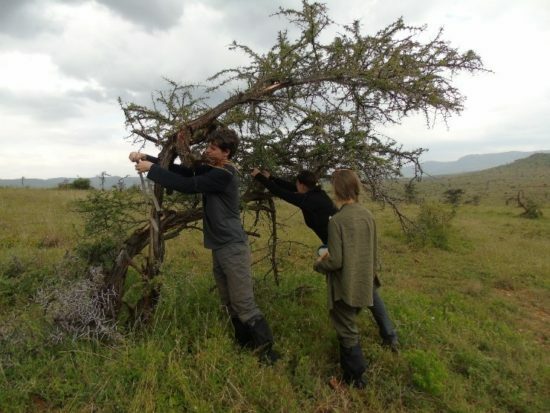 We thank Caroline Bettridge, Tom Butynski, and Yvonne de Jong for their advice and guidance, Paul Benson and Eleanor Monbiot for use of their compound at Mukima Ridge, and Charles Muhoro, Jackson Muraguri, John Theuri, Per Aronsson, and Paul Benson for assistance in the field. References: Bearder, S.K., Ambrose, L., Harcourt, C., Honess, P., Perkin, A., Pimley, E., Pullen, S. & Svoboda, N. 2003. Species-typical patterns of infant contact, sleeping site use and social cohesion among nocturnal primates in Africa. Folia Primatologica 74: 337–354. Butynski, T.M., Kingdon, J. & Kalina, J. (eds). 2013. Mammals of Africa. Volume II: Primates. Bloomsbury, London. 556 pp. De Jong, Y.A. & Butynski, T M. 2012. The primates of East Africa: country lists and conservation priorities. African Primates 7: 135–155. Grubb, P., Butynski, T.M., Oates, J. F., Bearder, S.K., Disotell, T.R., Groves, C.P. & Struhsaker, T.T. 2003. Assessment of the diversity of African primates. International Journal of Primatology 24: 1301–1357. Hill, A.P., Prince, P., Piña Covarrubias, E., Doncaster, C.P., Snaddon, J.L. & Rogers, A., 2018. AudioMoth: evaluation of a smart open acoustic device for monitoring biodiversity and the environment. Methods in Ecology and Evolution 9: 1199–1211. Nash, L.T., Zimmermann, E. & Butynski, T.M. 2013. Galago senegalensis northern lesser galago (Senegal lesser galago, Senegal lesser bushbaby). In: Mammals of Africa. Volume II: Primates. T. M. Butynski, J. Kingdon & J. Kalina, eds. Bloomsbury, London. Pp. 425–429. Perelman, P., Johnson, W., Roos, C., Seuánez, H.N., Horvath, J.E., Moreira, M.A., Kessing, B., Pontius, J., Roelke, M., Rumpler, Y. & Schneider, M.P.C. 2011. A molecular phylogeny of living primates. PLoS Genetics, 7(3), p.e1001342. Smiley Evans, T., Barry, P.A., Gilardi, K.V., Goldstein, T., Deere, J.D., Fike, J., Yee, J., Ssebide, B.J., Karmacharya, D., Cranfield, M.R. & Wolking, D. 2015. Optimization of a novel non-invasive oral sampling technique for zoonotic pathogen surveillance in nonhuman primates. PLoS Neglected Tropical Diseases 9(6), p.e0003813.